Did you immediately think of Russell Crowe as the hulking Maximus in “Gladiator?” If you did, you’re only half right. At around 11:45 P.M. last night, I discovered with a little help from Starz that it is hardly the most memorable utterance of the quote. In “Pineapple Express,” as Danny McBride’s scene-stealing dealer Red mercilessly beats James Franco’s Saul with common household items, he quotes “Gladiator” completely out of context (at 0:44 in the YouTube video, if you like to take my links). And the best part about it: I had seen “Pineapple Express” about 10 times and never noticed that line. I’m still laughing. One of my tests for a really good comedy is if I still laugh after multiple viewings. I howled when I saw “Pineapple Express” for the first time, and it still delivers countless belly laughs. And while I giggled more than cracked up the first time I saw “Baby Mama,” countless subsequent viewings have really made me appreciate the sophisticated humor. A common thread between the two movies is that they pack so much humor into a fairly small running time that I still haven’t caught it all. I can quote most of the movie. My favorite kind of comedy is one that relies on the spoken word to be funny; in other words, it needs to be infinitely quotable. “Baby Mama” features clever and witty one-liners like “I don’t want to be dramatic, but I would literally rather be shot in the face than eat this stupid food.” On the other hand, “Pineapple Express” offers a little bit more ridiculous lines, such as, “If you’re a man and act heroic, you’ll come back as a dragon … or Jude Law.” But its absurdity makes it no less quotable. I can rattle off lines from both of these movies for days. They have a cast of hilarious supporting characters. The most hilarious scenes in “Pineapple Express” come whenever Danny McBride’s Red is on screen, who says such profound things as “I’m not going to wake up murdered tomorrow!” But the movie also features hilarious antics from a dysfunctional team of hitmen, Mathison and Budlofsky, who constantly accuse each other of going soft. “Baby Mama” also has great turns from its supporting cast, including Steve Martin as the quirky CEO of Kate’s company who rewards her with 5 minutes of uninterrupted eye contact, Greg Kinnear (“As Good As It Gets”) as Kate’s love interest who operates a smoothie store, Maura Tierney (TV’s “ER”) as Kate’s sister who has kids of her own, and Holland Taylor as Kate’s mother who is frustrated by Angelina and Madonna showing off their adopted babies. The overarching messages are good ones. 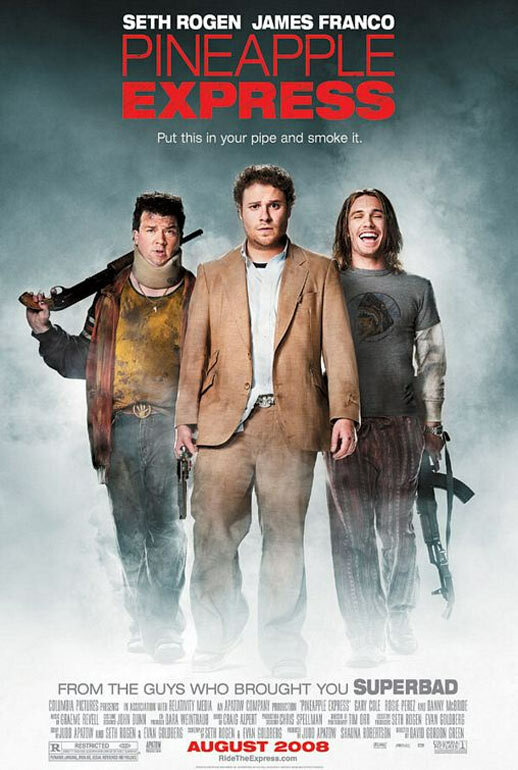 Many people are probably wondering, “How can a movie about a bunch of potheads have a good message?” To those people, I say that “Pineapple Express” to me portrays marijuana in a negative light, showing all the trouble that smoking it can bring. It shares with “Baby Mama” the theme of friendship and how one can form between the most unlikely of people in the most unlikely of circumstances. I find it refreshing to see the “opposites attract” concept (which has become so trite in romantic comedies) featured in movies that promote it as a positive aspect in friendships among the same gender. So, if you’re in a mood to laugh, flip your TV over to Starz for “Pineapple Express” and Cinemax for “Baby Mama” (although it will switch to HBO soon) or get in the car and go to your nearest Blockbuster. Either will provide nonstop fun and entertainment – even if you’ve seen them before. I didn’t quite love “Baby Mama” the way I love “Pineapple Express,” but both movies work the strong lead actors angle. Tina Fey and Amy Poehler might be the funniest women out there today (love “30 Rock,” love “Parks and Recreation”), so simply putting the two of them together in a movie is a smart idea. And I fell in love with James Franco all over again. Why doesn’t anyone remember that he can do comedy? He’s got so much more going for him than his looks, and I’m thrilled David Gordon Green took a chance on him. Franco definitely earned that Golden Globe nomination. Both of these movies are hilarious. I agree that one of the best parts of each is that you can quote so much of them. I’m so lucky to have Cinemax and that they are finally showing them occasionally. Check out the new Cinemax site for their extensive movie and tv lineup.